South Bank BID and South Bank Marketing Group have released their first Winter video, aimed at promoting South Bank to domestic and international visitors ahead of the Christmas festivities. 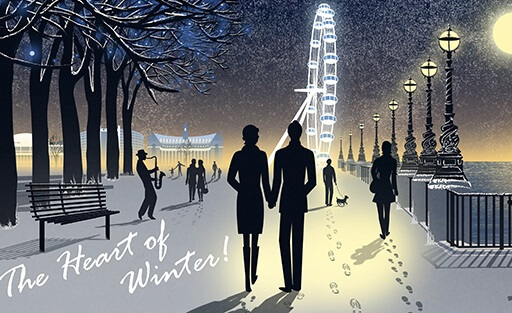 Released in conjunction with the BID and South Bank London, the #HeartofWinter campaign promotes some of the key things to do in South Bank that are available to BID members and the general public in over the coming winter months. What to see in London: South Bank, The Heart of Winter is a celebration of the continued success of organisations within London’s South Bank and demonstrates the multifaceted appeal of the South Bank, both as a tourist destination and as a place to live and work. Click here to see the video What to see in London: South Bank, The Heart of Winter for yourself, or simply see below. Forget about Widow Twanky, South Bank arts centres are pulling out all the stops when it comes to original and magical shows, from The Old Vic’s The Lorax to BFI Southbank’s LOVE season. Whilst it’s the season to indulge, in the true spirit of giving, South Bank have a huge array of free events – from exhibitions to films. There are plenty of places to release your inner child – whether it’s the Christmas experience at Shrek’s Adventure or on board a London Duck Tour. And once you’ve exhausted yourself, you’ll be pretty hungry – gastronomes won’t be disappointed as every taste and budget is catered for. This is your one-stop-shop for all your winter events, guides and offers. Glad tidings one and all.